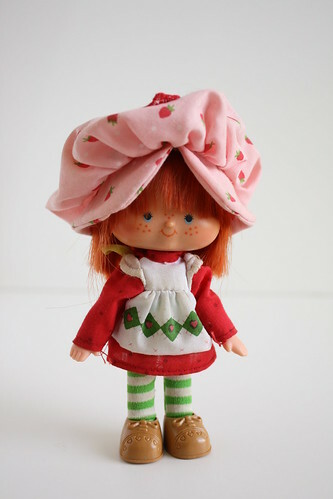 When we were cleaning out our basement for our move a few months ago, I came across a box that held some of the most beloved of all my possessions: my Strawberry Shortcake dolls. I knew I had these, of course, but I hadn’t opened the box in about seven or eight years, so I’d forgotten exactly what was in it. 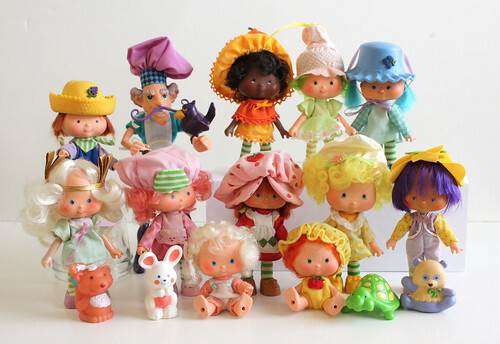 The box held all of my dolls — most of them still in their original boxes — and several play sets that went with them. I nearly started crying with happiness right there on the spot. 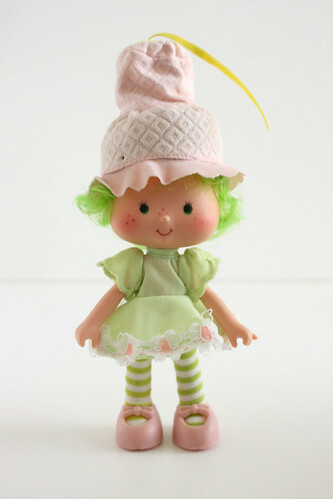 Everyone has a toy that is the most special to them — the object that comes to mind when someone says the word “toy” — and my Strawberry Shortcake dolls are mine. I have fond memories of a lot of my playthings — Barbies, Lego, my Cabbage Patch Kid, Fisher Price toys — but these were the creme de la creme of all of my toys. I played with these constantly. I pined for new dolls. I poured over the little catalogs that came in the boxes. I wanted Strawberry Shortcake clothes and sheets and books and movies. I inserted the word “berry” in conversation more times than I care to admit. In many ways, these toys are a physical manifestation of my childhood. Heady stuff, right? Would you like to meet my little friends? Of course you would! 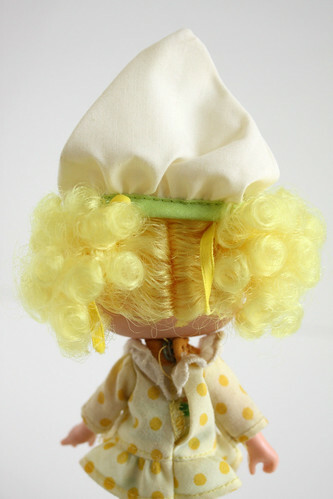 First up is the girl herself, Strawberry Shortcake! Frankly, though I loved old Strawbs, I secretly didn’t really think she was all that cute. Her outfit is OK, I guess, but that hat is just awful. What the heck is up with that thing? What hat style is that based on? I do like her pinafore though and those striped tights are fantastic. 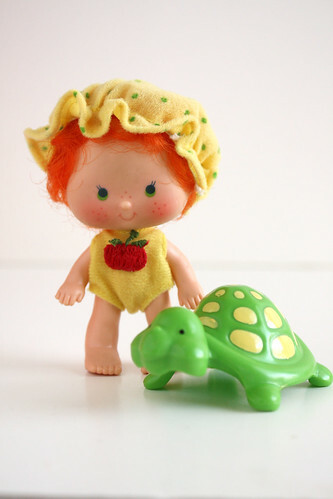 Next we have Apple Dumplin’ and her pet Tea Time Turtle. 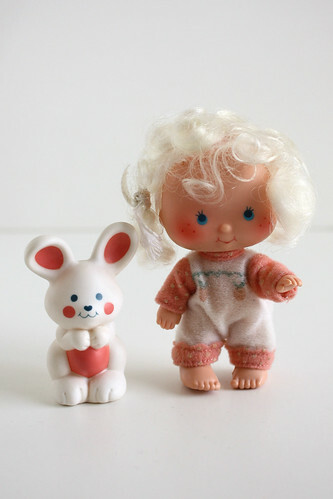 Apple Dumplin’ was a baby and I’m vaguely remembering that she was Strawberry Shortcake’s little sister. Does that sound right to anyone else, or am I just making that up? Next up — Blueberry Muffin! Of all of the dolls I dug out, this one has fared the worst. 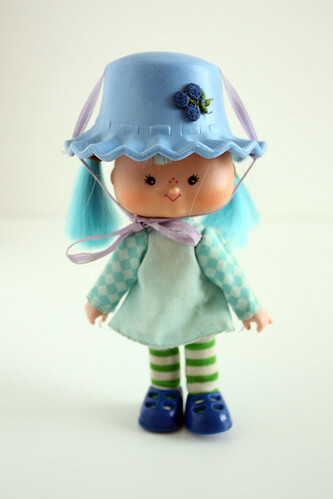 Her hat has this weird sticky residue all over it and the rubber bands that held her pigtails have rotted. Here is the token boy — Huckleberry Pie. I always thought he had a really cute face, but his outfit is lame. I remember playing that he was going fishing a lot. Raspberry Tart was another favorite, probably because she was pink. (I was a pink-loving girl.) 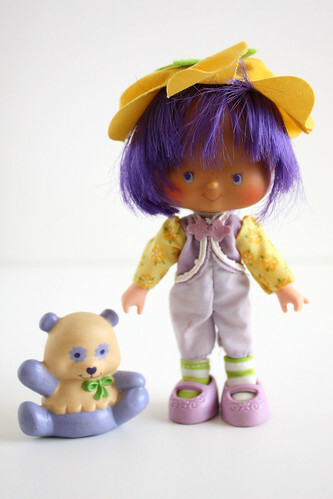 This character was my best friend, Nancy’s, favorite. I like her bloomers and the eyelet on her shirt. She also has fantastically cute shoes. This is Apricot, another baby, and her rabbit Hopsalot. I lost Apricot’s hat, which is a bummer. 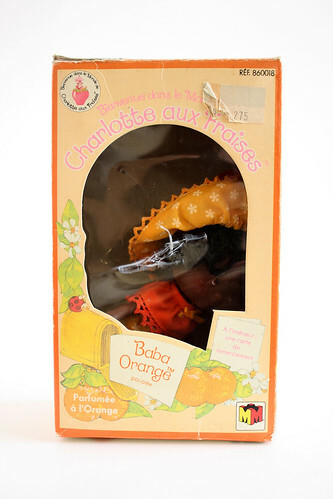 Incidentally, Apricot is the only one of the dolls that still has any fragrance left on her. 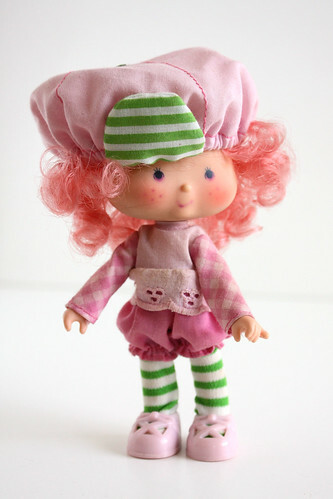 That was one of the big features of the Strawberry Shortcake dolls — they all smelled like their namesakes. This is Orange Blossom. She is special because my Grandma bought her for me on a trip to Belgium. The box she came in is written in French! 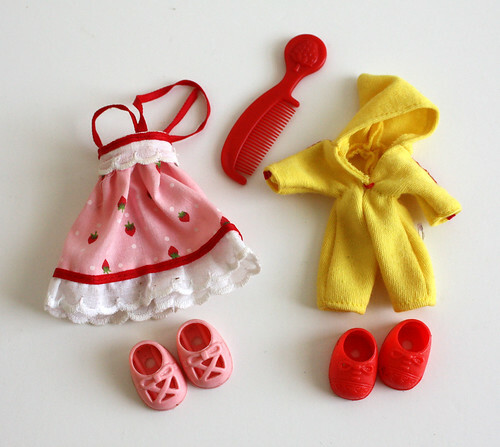 My grandma bought me most of the toys in my Strawberry Shortcake collection. When I was a kid, she was an assistant manager at K-Mart and one of the departments she supervised was toys. How awesome is that? She often got deals on toys when they went on Blue Light Special and my brother, cousins and I were spoiled rotten. Why did my grandma buy Orange Blossom in Belgium? 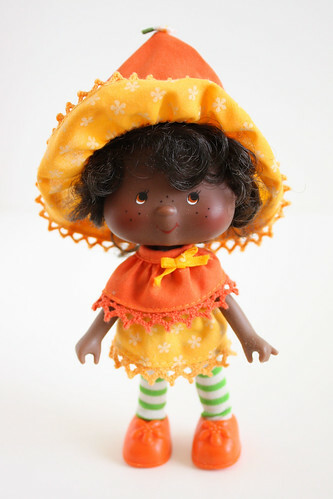 Because K-Mart didn’t sell black dolls. Even at the age of nine, I was outraged by this fact. My grandma looked all over town for Orange Blossom and couldn’t find her anywhere. So she bought her in another country. Crazy. This little cutie is Lime Chiffon. 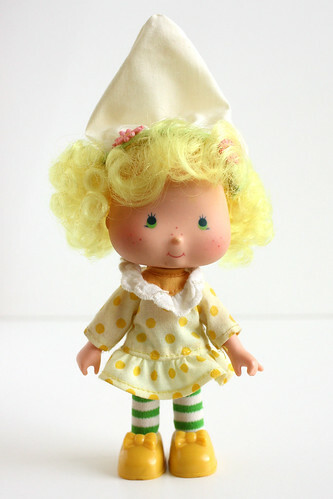 I actually don’t remember her very well, so I’m guessing she came along close to the end of my Strawberry Shortcake obsession. I also have the little parrot that came with her but I didn’t find it in the box until after I took her picture. Here we have Almond Cookie and MarziPanda. The doll is in great shape, but the bear is pretty gross — dirty and sticky. I think these little sidekick animals didn’t do so well because the fragrances reacted with the plastic. This disco diva is Angel Cake. Her skunk Souffle used to be purple. 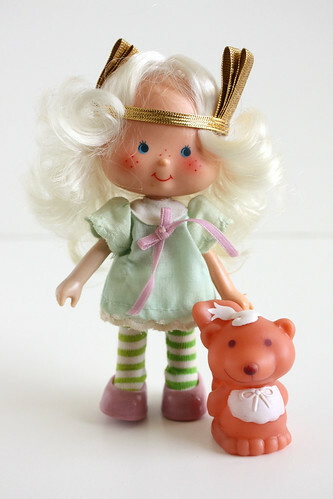 I love Angel Cake’s awesome gold headband and her Farrah hair. And finally we have The Purple Pieman and Berry Bird. 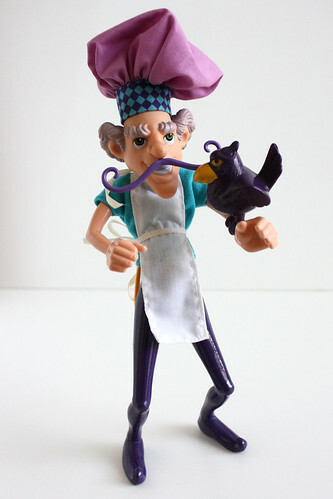 The Purple Pieman was the bad guy of Strawberry Land and I distinctly remember that he cackled a lot when I played with him. He also tried to steal whatever the other dolls were eating. I also found a few extra outfits in one of the boxes that I’d completely forgotten about — a party dress and a one piece jogging suit. I love how very 80’s that is! This is also the only comb I found in any of the boxes. Kind of crazy since all the dolls came with one. I remember those combs being everywhere in my room when I was growing up. I also saved a lot of the papers that came in the boxes with the various toys. 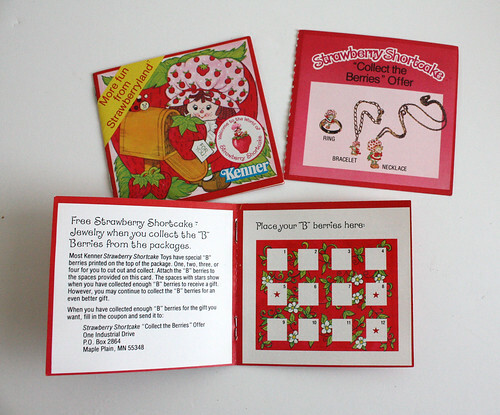 Here you can see a catalog and one of the cards you could fill up with proofs of purchase to get Strawberry Shortcake jewelry. I saved enough for the ring and the necklace, but they are nowhere to be found. 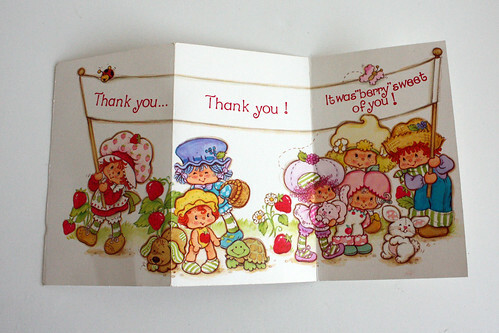 Here is one of the thank you cards that came with every doll. I used to just sit and stare at this, in awe of how cute it was! Tomorrow: the play sets, including The Berry Bake Shoppe! 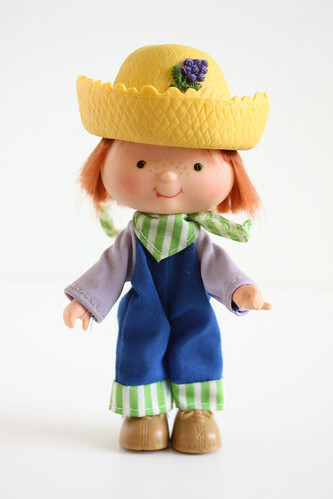 Did you play with Strawberry Shortcake dolls? Tell me about it!